In May 2009, Matheus Lumber acquired an existing multifamily wholesale operation located 30 miles south of Austin, Texas in San Marcos. This acquisition placed us in the middle of the fastest growing metro area in the U.S. today – Central Texas. General Manager, Scott Hall is leading this Austin-area based sales group in covering the Texas marketplace along with the broader area of the entire lower 48 states. Matheus’ San Marcos office specializes in mill-direct servicing of large wood-framed multifamily structures anywhere within the United States, with particular focus on the DFW/Houston/Central Texas triangle. Our portfolio of projects includes market rate apartments, condominiums, senior & assisted living quarters, student housing, military housing, churches, resort centers, casinos, and other forms of hospitality projects. We have completed projects ranging from a 40,000 SF private hunting lodge in South Texas to a 350 single-family military housing project at Lackland Air Force Base, San Antonio, Texas. 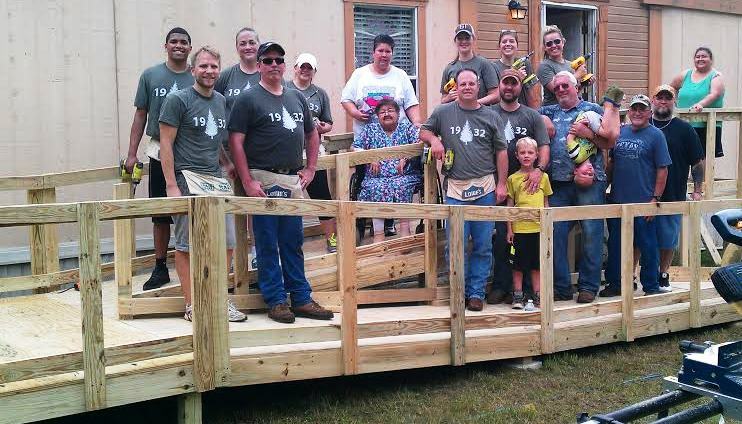 Matheus Lumber Company’s Texas Branch employees built this handicapped wheelchair ramp on a home as part of the Texas Ramp Project. It was a great team-building experience for everyone involved, and the company intends to continue its involvement with this worthwhile charitable organization on future projects.